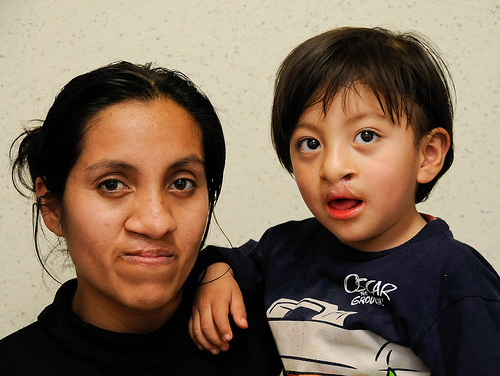 When Eladia brought her son Luis into the pre-op clinic, she caught the attention of the staff because she, too, had a cleft lip and palate. Three-year old Luis’ cleft lip had been treated two years by a Rotaplast mission and he was back this time to have his palate repaired. It’s unusual for an adult to be treated at the children’s hospital but the Rotaplast team took a look at her and decided that her appearance could be enhanced with some additional work on her lip. I took a few minutes and with translator Vikki Patino’s assistance listened to her story. Eladia lives in the Oaxaca valley town of Ejutla de Crespo, a two hour bus ride from the hospital. She works as a cook in a restaurant. Luis is her only child but she has two brothers and three sisters, one also with a cleft. She has suffered deeply, enduring the taunting of her schoolmates who made fun of her. She also confided that people don’t take her seriously. It’s very difficult to understand the extreme nasal quality of her voice due to her cleft palate and lack of speech therapy. The early intervention provided by Rotaplast for her son has made it easier for him. She feels he is being accepted better. Eladia added she appreciates what our team is doing and thanks us for coming here to treat people who cannot get ahead because of economic reasons. Eladia’s story went right to my heart as I recalled my own childhood growing up with a cleft lip and palate. Having the opportunity to reach out to her and hopefully giving her some comfort by letting her know that I truly understand is what makes participating in a Rotaplast mission such a fulfilling experience for me. I know we are making life altering changes that go far beyond external appearances.